This is a battery holder for Yaesu FT-817, using 3 x 18650 Li-Ion protected cells. You need to replace the original battery cover with the 3D printed one. It’s basically a nicely designed 3D-printable part for 3 x 18650 Li-Ion cells, load balancer, fuse, etc. Thanks to a new cover, the cell can be charged while inserted in the rig. I have not yet tried it, but 3400 mAh with the ability to charge it in 1 - 2 hours sounds like something. The idea of the 3D printed case including the fuse is great - I presume there’s a take off for the green wire to tell the 817 not to charge the pack when an external 12v is aplied? It needs a replacement (also 3D printed) cover apparently, so I wnder if that’s just to get the charging terminals outside or whether the standard cover no longer fits? The Panasonic 18650 NCR series and the 18650B are very high-capacity cells. The BD and BE are variations of this, in this post I will compare them. I might look at this once my 2.5Ah LIPO that I have in my 817 gives up (they tend to last about 2.5 years I have found (at my usage level)). you are right - I had blindly assumed that a modern LiPo can be charged at 0.5 - 1 C, but Panasonic seems to play safe and restrict the charge current to 0.9 A according to the datasheet. But still a nice solution, and since it’s based on cells with internal protection, it also looks like a much safer approach than the many RC model LiPo approaches used in the community - the RC batteries typically have no discharge protection and can thus catch fire or explode more easily. I presume there’s a take off for the green wire to tell the 817 not to charge the pack when an external 12v is aplied? It is not safe to run an FT817 on external power with LiPo cells fitted even if the green wire is disconnected. The FT817 still tries to trickle charge the battery and that is not safe. I know because I have a LiPo pack in my 817 and it got very hot when I ran on external power after the LiPo voltage got low. If you don’t want the radio to charge the cells in any way then you need the green wire connecting. It is that connection by default in the AA cell battery pack that stops the 817 charging the cells. If you don’t want the radio to charge the cells in any way then you need the green wire connecting. With protected 18650 cells, it should be all OK, shouldn’t it? I’ve seen “chargers” for these things that just connect the cell straight across some fairly random voltage (e.g. one cell straight across the output of a nominal 12V supply). They must be pretty robust to survive that. I was under the impression that the Green wire only disables the timed charging logic and that the trickle charge still happens. So by default an unmodified 817 with disposable cells and an external supply applies a charging current to those cells? That sounds seriously bizarre. It may be true. But it’s still bizarre. That would make sense, and I think the Yaesu people know what they are doing. Hi Colin - I know that - that’s why I questioned whether the cable was there. With my LIPO, I have a simple voltage divider (2 100k resistors) across the output to provide the sense voltage on the green wire to tell the 817 not to allow charging from an external source. The same principal used as when the AA container is installed in the rig. 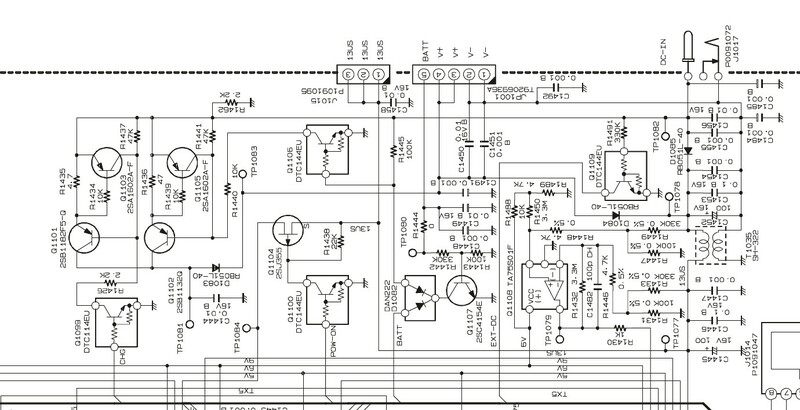 I’ve managed to find the circuit diagram for the charging circuit. It looks to me like if the green wire is connected and has a suitable voltage then even trickle charging is disabled. However there is a corner case that might be dangerous. 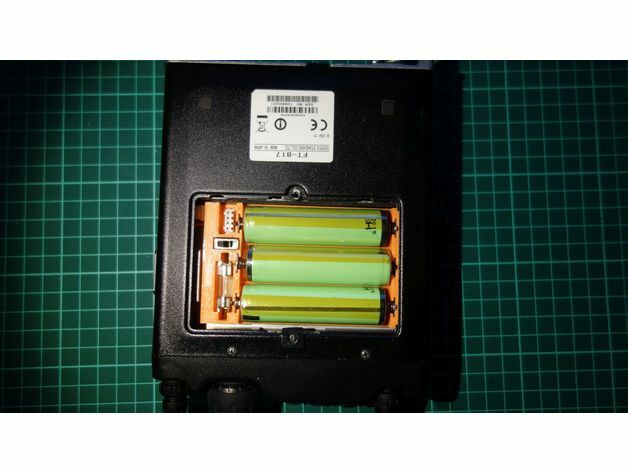 If the battery pack was very discharged then it’s possible there might not be enough volts on the green wire to disable charging, this could cause problems with a flat Alkaline battery pack. Although hopefully the voltage on the green wire would rise quickly and cut off the charge. 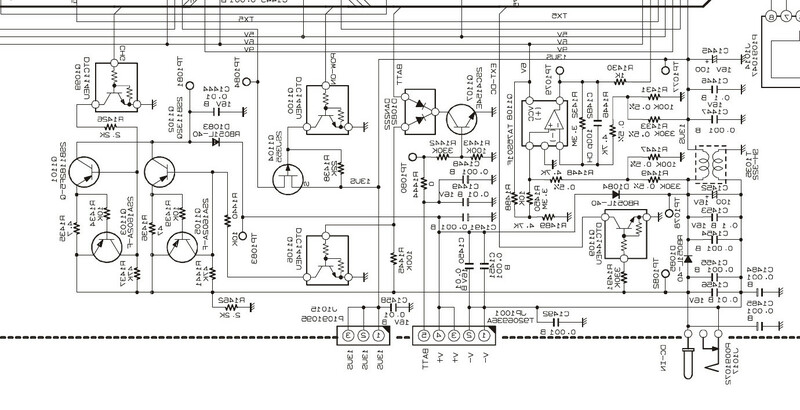 I’ve attached the relevant part of the circuit. That’s the circuit for the Australian models. Do you have the EU/NA circuit? Well … Hopefully no smoke, magic or otherwise. That circuit has 2 charging sources. A higher current one and a trickle charger. The higher current charger is enabled from the CHG line controlled by software. The trickle charge runs all the time unless disabled by the BATT signal. The BATT input will switch Q1107 when it’s above 3V. That transistor is used to turn off the trickle charge and to signal the software there is a battery connected. The presence of the BATT signal to the software should lock out enabling charge and disable it if it was selected. Given BATT is only connected when a non-rechargable battery is installed normally and the green wire mode removes that signal then you’ll be safe to connect up LiPOs to the connector as long as the green wire mod is not performed. The design calls for protected 18650s to be used. These have a circuit in them that isolates them if you try to draw current when the cell is discharged to its minimum voltage. i.e. you can’t over discharge them. It also disconnects them if the voltage applied to the cell exceeds 4.2V. With that type of 18650 and the green wire in place, the whole system looks to be fine and dandy. Now my analog is rusty so I’m happy for someone to point out what I’ve missed from looking at that circuit and considering what the software should be doing with the CHG output and BATT input. Well I think we know what you mean, but “green wire mod” refers specifically to cutting the green wire in the battery tray which is designed to hold 8 AA cells. If you are using LiPo cells, then you cannot be using that battery tray, so there is at the outset no green wire to cut. To inhibit charging, you would have to provide a green wire and arrange that it has a suitable voltage on it, either by connecting to an intermediate cell or by using a voltage divider. With that type of 18650 and the green wire in place, the whole system looks to be fine and dandy. Indeed so, but if you do have protected cells, why bother with the green wire? Why not leave it out, and let the FT-817 charge the battery if it wants to? As soon as one cell reaches the fully charged state, it will stop safely. You probably do want an external charge connector so that you can balance the cells from time to time, and possibly charge them faster than the FT-817 can. But I see no harm in letting the radio charge them. It will provide a useful and convenient top-up charge. Clearly you mustn’t use both charging methods at the same time (I presume this is why the battery tray that started this thread provides a switch). Obviously with unprotected lithium cells it’s a really good idea to provide the green wire signal if there is any possibily that you will connect external DC with the batteries still in circuit. So has anyone actually built one of these battery containers for an Ft-817/8? I recently got one and I feel the stock battery with it self-discharge is pretty garbage for any long-ish term storage (any more than a week). A friend of mine used 18650s in his FT-60 and it has sat in his backpack for weeks and it is still at peak charge. I hear stories about the volatile nature of 18650s so I am leery about making this without talking to someone who has already successfully built and used one. I have been using the 3S LIPO solution in my FT-817ND for over 6 years with no problems (I’m now on my third battery as they have been driven hard on many SOTA activations). As you note the Yaesu NiCAD seems to have a problem holding charge over any length of time and in my experience runs down very quickly. The 3S 2500 maH flat LIPO cell (from HobbyKing) doesn’t have such issues. So have you used the 3D Printed, 18650-filled version that is featured at the top of this forum? I did see that I could buy like a windcamp lipo that fits there fine, but I like the idea of using 18650s because I have a pile of them. Does the Hobbyking flat lipo have the right connectors or did you have to rig it together?